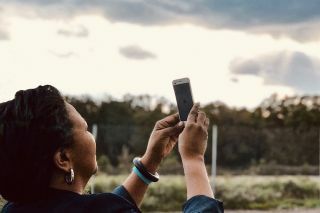 Former NASA astronaut Mae Jemison participates in the "Look Up" campaign just moments after its launch on Oct. 17, 2018. To help humans really connect with one another, former astronaut Mae Jemison has a simple request — just look up. Jemison, along with SETI scientist Jill Tarter and "Star Trek: The Next Generation" star LeVar Burton, co-created a new campaign called "Look Up" that will run today (Oct. 18) until 8 p.m. EDT (midnight GMT on Oct. 19). Participants can download a free app called Skyfie (available on iOS and Android) and share their images of the sky from all around the world. Check out more details here. Although Jemison didn't quite say this, the campaign sounds a bit like re-creating the "overview effect" on Earth. Jemison and other astronauts have spoken about the profound experience of seeing our planet from space, with no national boundaries delineating differences. While not everyone has access to a spaceship, everyone (in theory) should have at least some access to looking at the stars — depending on how light-polluted your neighborhood is, of course. After astronaut Sally Ride became the first American woman in space in 1983, Jemison applied to NASA. She was accepted in 1987 and flew as a mission specialist on shuttle mission STS-47 in September 1992. This flight made Jemison the first African-American woman in space. Jemison acknowledged that astronauts such as herself get the lion's share of attention in the human space program, but to her, the workers on the ground have equally or even more compelling stories. The people setting the heat-shield tiles for her mission, she told Space.com, had high school degrees. And there is also the story of the African-American women who supported the first few NASA human spaceflights as mathematicians and orbital dynamicists, a story poorly known until the publication of the 2016 book "Hidden Figures" (which generated a Hollywood film that year). "I think it's getting a bit better," Jemison said about acknowledging the workers on the ground, especially people of color. "But I don't think it's where we need to be," she said. The Apollo moon program will celebrate its 50th anniversary of the first human landing next year. While the world will be focused on the astronaut achievements, Jemison said it's important to remember people such as the secretaries and the staff working at NASA to support the program. "They felt like they were part of Apollo, and Apollo wouldn't have happened without them." Mae Jemison flew on space shuttle mission STS-47 in 1992, and has continued promoting space exploration ever since. The project is funded by NASA and the Defense Research Advanced Projects Agency (DARPA). Jemison's foundation won the initial solicitation in 2011; she also spoke proudly of the Canopus Awards that Starship gives out for excellence in interstellar writing, a project that started in 2015. "We did that because again, we are trying to figure out how we can let people be involved in substantive ways … space isn't just for rocket scientists," Jemison said. It was at a conference for Starship that she, Tarter and Burton also thought of "Look Up," she added. Jemison said she uses every tool she can to engage with the public, citing her 1993 appearance on "Star Trek: The Next Generation" and the time she spends speaking with children's groups across the country. She sees "Look Up" as a natural outflow of this activity, just to allow people to contemplate the possibilities of space — even if that contemplation does not necessarily lead to a career in science, technology, engineering or math (the STEM fields). "For me, for space exploration to make a difference, to really be embraced, we have to make a way of including people where they are, and 'Look Up' is really about that," she said, adding that part of the campaign includes asking people to consider when they last looked up at the sky. Because if they seriously contemplate space, she said, "It starts to change you."